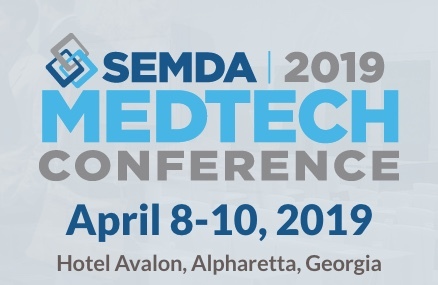 As partners for the past five years, Write2Market eagerly anticipates the SEMDA 2019 Medtech Conference on April 8 – 10 at the Hotel Avalon in Alpharetta, Georgia. What gets us so jazzed about the annual event? First, we meet the entire southeast medtech ecosystem in three concentrated days. We learn from investors, large strategic medtech companies like J&J Innovations, early-stage innovators and entrepreneurs, allied service providers including legal and regulatory consultants and more. Nowhere else can we connect with so many potential medtech partners and clients so efficiently. Speaking of clients, we know the annual SEMDA Medtech Conference builds business for the Write2Market healthcare practice. Our participation in SEMDA Annual Conferences has played a direct role in generating multiple new clients and associated revenue growth for the agency. This helps the Write2Market healthcare practice support our clients’ growth as well through our metrics-based integrated marketing and PR campaigns. At Write2Market, maximizing earned and sponsored conference speaking opportunities is integral to the marketing value we deliver for our clients. Because we know these opportunities generate new leads and new clients, we walk the walk ourselves by generating speaking opportunities in high-value healthcare industry events where our clients and potential clients congregate. SEMDA’s Annual Conference is precisely one of those events. SEMDA 2019 is no different. Paul will be moderating a breakout session entitled: De-risking medtech innovation by investing in the process before the product on Tuesday, April 9 at 3:30 p.m. Joining W2M VP of Healthcare Paul Snyder will be Dr. David Adair (Solas BioVentures), Tiffany Wilson (GCMI) and Ashley Wittorf (AdvaMed Accel). What is the current state of the medtech investment landscape? What is easier? What is harder? How is the FDA evolving and can they keep up with AI, IoMT, connected devices and blockchain in healthcare? More importantly, how can we get more venture capital off of the sidelines and into products that deliver value? David, Tif and Ashley will provide insights on those questions and discuss elements of medtech design and development models that de-risk medtech innovation to fail faster, cheaper and help ensure funding investments are made in products with a higher likelihood of successful, capital efficient commercialization. You can find the conference agenda and registration page link here. If you are an investor considering a new medtech investment, a young medtech company or entrepreneur seeking to connect with those investors or a service provider looking for new clients in the space, SEMDA 2019 is for you. If you are a qualified investor, email paul@write2market.com for a special registration code. Previous PostAnother SEMDA Medtech Conference is in the books. What did we learn at SEMDA 2019?